Many judges have operated as if they were independent of the agency and awarded or denied benefits based on their own judgments. A few weeks ago, the SSA notified the judges of the changes. The job descriptions will no longer include the words "complete individual independence," and will also clarify that the judges are "subject to the supervision and management" of other agency officials, according to a draft reviewed by The Wall Street Journal. The Journal also has a blog item with more details. Chuck Blahous, one of Social Security’s public trustees and a senior research fellow at the Mercatus Center, writes on proposals to increase Social Security benefits. Check it out over at e21. Social Security: Big deal or no deal? George Mason economist Bryan Caplan weighs in over at EconLog. "The Future of Old Age Income Security"
This is the revised version of the Robert Butler Memorial Lecture delivered at the International Centre Global Alliance Symposium on ‘The Future of Ageing’ on 21 June 2013 in Singapore. The lecture covers and discusses about the future of income security and social welfare discussing global trends in developed and developing countries using the 2012 Revision of the UNDESA’s World Population Prospects. "Can Pensions Be Restructured in (Detroit’s) Municipal Bankruptcy?" This paper, which was written as a White Paper for the Federalist Society, describes and assesses the question whether public employee pensions can be restructured in bankruptcy, with a particular focus on Detroit. Part I gives a brief overview both of the treatment of pensions under state law, and of the Michigan law governing the Detroit pensions. Part II explains the legal argument for restructuring an underfunded pension in bankruptcy. Part III considers the major federal constitutional objections to restructuring. Part IV discusses arguments based on the Michigan Constitution and Part V assesses several Chapter 9 arguments against restructuring. None of these arguments appear to prevent restructuring. Assuming that pensions can in fact be restructured, Part VI discusses the Chapter 9 factors that may affect the extent to which they are or can be restructured in a particular case. "The Cost of 'Choice' in a Voluntary Pension System"
The United States and most other industrialized nations have multi-pillar retirement systems that fit within the World Bank’s multi-pillar model for retirement savings consisting of a first-tier public system, a second-tier employment-based pension system, and a third-tier of supplemental voluntary savings. While in many countries, the second-tier occupational pension is mandatory or quasi-mandatory, in the United States, both the second and third-tier retirement savings systems are voluntary. That is, employers are not required to offer pensions, and when they do, they have considerable choice over the type of pension plan to have and over many of that plan’s features. Moreover, when employers do offer a pension plan, it is probably a 401(k)-type plan that offers employees considerable choice about whether to participate, about how much to contribute, about how to invest those contributions (and prior accumulations), and about the timing and nature of distributions. In short, unlike our first-tier, mandatory Social Security system, America’s second-tier, private pension system is replete with choice: choices about the type of pension plan, choices about the amount and timing of contributions, choices about investments, and choices about the timing and nature of distributions. To be sure, the availability of pension choices may be of value to employers and individuals, but, on the whole, the costs of choice almost certainly exceed the benefits. Pertinent here, one of the major problems with the current pension system is its incredible complexity. That complexity imposes significant costs on individuals, employers, and government, especially when compared to the relatively rigid, but straightforward, Social Security system. As more fully discussed below, the administrative costs for Social Security’s retirement system are well under 1% of benefits paid. Meanwhile, other than the cost for a payroll withholding service, employers incur almost no costs because of Social Security; and almost the only choice that workers face is the choice about when to take their benefits, at which point in time, a costless and simple application leads to a lifetime of inflation-adjusted retirement income. On the other hand, employers, individuals, and government all incur significant costs in connection with the current pension system. Employers incur significant costs in choosing, designing, administering, or even outsourcing their pensions; individuals incur significant costs in connection with the management, investment, and distribution of their contributions and benefits; and the government incurs significant costs in regulating thousands of disparate pension plans and millions of Individual Retirement Accounts (IRAs). Also, because of the voluntary nature of our second-tier, private pension system, coverage and participation rates are low, and retirement savings may be inadequate for many retirees. All in all, this Article focuses on the costs of choice in America’s voluntary private pension system. At the outset, Part II of this Article provides an overview of the current U.S. retirement system — both Social Security and private pensions. Next, Part III of this Article looks at the costs associated with the current Social Security and private pension systems. Finally, Part IV of this Article outlines some ways to reduce the costs associated with the private pension system. In particular, Part IV discusses how to reduce costs by moving to a universal, second-tier pension system; and Part IV also discusses some more modest approaches for reducing the costs associated with the current private pension system. "Pensions, Employment, and Family Programs"
Pension, employment, family, and health insurance programs constitute the four major categories of social policy. This report discusses the options for the design of programs within the first three categories based on a framework that aims at providing universal social security protection throughout Mexico. Although the core benefits of these programs are monetary benefits, their provision requires application of solid strategies specific to each program for the regulation of suppliers, provision of a fiscal framework, and interaction with other programs and institutions. Employment programs require use of a seamless design within the educational system and business training programs, as well as the adoption of an unemployment insurance program. Family programs, including the main programs that combat extreme poverty, should be incorporated into a general framework to allow them to serve as vehicles for the integration of the beneficiaries into society. At the same time, implementation of family programs is key to solving the special challenges of female workers, integrating the disabled into the labor market, adopting a policy for the comprehensive development of young children, and addressing the growing problem of long-term disability care. Finally, realization of successful pension programs requires a platform upon which to articulate the fiscal aspects, service solutions, and multiplicity of the increasing number of programs that serve the elderly and disabled. "Race, Trust, and Retirement Decisions"
Using the 2008 National Longitudinal Survey of Youth, this study investigates whether racial differences in trust can explain decisions to consult a financial planner and the variation in accumulated retirement wealth. Black and Hispanics are more likely to report having low trust compared to non-Black, non-Hispanic respondents. The results show evidence that low trust impacts the two outcome decisions of Blacks more relative to non-Black, non-Hispanic respondents. Low trust minimally affects Hispanics relative to non-Black, non-Hispanic respondents as it related to the decision to consult a financial planner and the accumulation of retirement wealth. Marginal effects of Tobit regression analysis show no evidence of racial difference in the effect of a financial planner. The creation of non-contributory pension schemes is becoming increasingly common as countries struggle to reduce poverty. Drawing on data from Mexico’s Adultos Mayores Program (Older Adults Program) -- a cash transfer scheme aimed at rural adults over 70 years of age -- we evaluate the effects of this program on the well-being of the beneficiary population. Exploiting a quasi-experimental design whereby the program relies on exogenous geographical and age cutoffs to identify its target group, we find that the mental health of elderly adults in the program is significantly improved, as their score on the Geriatric Depression Scale decreases by 12%. We also find that the proportion of treated individuals doing paid work is reduced by 20%, with most of these people switching from their former activities to work in family businesses; treated households show higher levels of consumption expenditures (on average, an increase of 23%). Very importantly, we also rule out significant anticipation effects that might have been associated with the program transfers. Thus, overall, we find that non-contributory pension schemes target to the poor in developing countries can improve the well-being of poor older adults without having any indirect impact (through potential anticipation effects) on the earnings or savings of future program participants. That means, for example, that if the Social Security payroll tax rate was increased immediately and permanently by 3.36 percentage points—from the current rate of 12.40 percent to 15.76 percent—or if scheduled benefits were reduced by an equivalent amount, then the trust funds’ projected balance at the end of 2087 would equal projected outlays for 2088. In addition, CBO provides a closer focus on how Social Security’s finances will evolve over the next quarter century. This, folks, is how it’s done: solid, detailed analysis, presented with plenty of charts and tables to make it understandable. Check it out here. A new Michigan Retirement Research Center Working Paper is available for download. View the Abstract and Key Findings below. The National Academy of Social Insurance (NASI) seeks a mid-level Program Analyst for policy analysis, research, outreach and education activities on income security and related issues. The Academy is a nonprofit, nonpartisan organization devoted to research and education on Social Security, health care financing, and related public and private programs. Its 1,000 members are among the nation’s leading experts on social insurance programs and policy. Responsibilities: The Income Security Program Analyst will be part of an interdisciplinary team that conducts and disseminates NASI’s policy analysis, research, and education activities on income security and related issues. S/he will work with the team on public education campaigns on Social Security and related issues, including developing and implementing strategic partnerships and new outreach initiatives. S/he will collect, analyze, and synthesize research and policy analyses. S/he will plan events and participate in outreach and dissemination of NASI materials with the goal of promoting deeper understanding of social insurance programs – to include Social Security, unemployment insurance, disability income policy, and related issues – among the public and among policymakers and their staffs. The Program Analyst reports to the Academy’s Vice President for Income Security Policy. Plan and produce synthesis reports on project activities for the funder and the public. Work with other staff to promote event participation and track event outcomes. Draft blogs or other materials to bring attention to NASI content. Work with development staff to research and identify new sources of funding and draft funding proposals and grant reports on issues related to income security. Familiarity with social insurance programs, such as Social Security, unemployment insurance, and other income security programs. Compensation: Salary is commensurate with experience. Benefits include health insurance, pension, paid vacation, sick leave, and all federal holidays. To Apply: Send cover letter, resume, writing sample and three references to nasi@nasi.org with the subject line “Program Analyst.” Or by mail to: National Academy of Social Insurance, 1776 Massachusetts Avenue NW, Suite 400, Washington, DC 20036. Applicants are encouraged to apply early, as applications are being reviewed on a rolling basis. The National Academy of Social Insurance is an equal opportunity employer. Minorities and persons with disabilities are encouraged to apply. The 2010 National Retirement Risk Index showed that 53 percent of households will not be able to maintain their standard of living in retirement. But equity and house prices have both increased since then. the more robust growth in stocks mainly benefits the top third of households. In November 2011, the Census Bureau released its first report on the Supplemental Poverty Measure. The SPM addresses many criticisms of the official poverty measure and is intended to provide an improved statistical picture of poverty. This article examines the extent of poverty identified by the two measures. First, we look at how the SPM and official estimates differ for various aged and nonaged groups. Then, we look at why the SPMpoverty rate for the aged is much higher than the official rate. "Growth in New Disabled-Worker Entitlements, 1970–2008"
In this article, we analyze the growth in new disabled-worker entitlements from 1970 through 2008. The number of newly entitled workers has increased along with the working-age population because more women worked and became insured for disability, and the baby boom generation moved into disability-prone ages. We decompose this incidence growth into the part attributable to those factors and a residual part attributable to factors like program changes or business cycle fluctuations. We find that the three factors — (1) population growth, (2) growth in the proportion of women insured for disability, and (3) movement of the large baby boom generation into disability-prone ages — explain 90 percent of the growth in new disabled-worker entitlements over the 36-year subperiod (1972–2008) and 94 percent of the growth over the second half of that period (1990–2008). Comparing the earlier period to the later, a seeming speedup in disability incidence in 1990–2008 relative to 1972–1990 disappears once we account for the changing demographic structure. The fiscal predicament facing the U.S. government is a double one: how to bring taxes and spending into rough long-term balance while ending the squeeze on non-entitlement spending enshrined in current law. It’s not an easy task. It won’t get any easier if progressives define progressivism as opposition to budgetary realism. Do seniors steal jobs from younger workers? 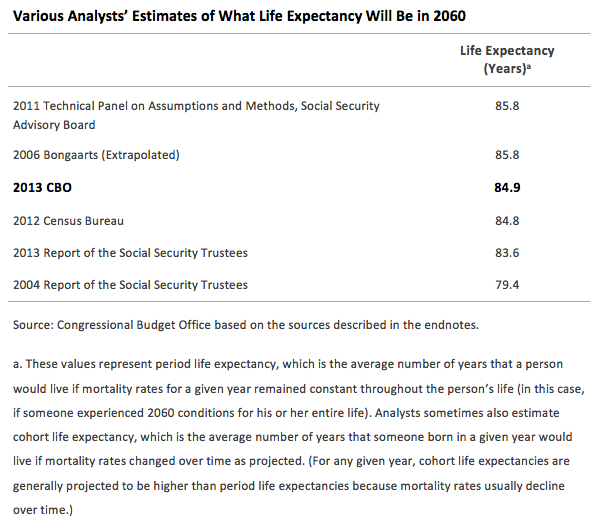 Gene Steurle and Caleb Quackenbush of the Urban Institute have updated their figures showing the lifetime Social Security and Medicare taxes people pay, based on when they’re born, and the lifetime benefits they can expect to receive. There’s an interesting pattern here: for early cohorts, say the 1960 cohort shown on the left, the real money was in Social Security: you paid a little Social Security taxes and received a load of benefits. Medicare was a bonus: people at that time paid next to no Medicare taxes, but the lifetime benefits weren’t all that much. Today, it’s a different story. Social Security has turned the corner, both through higher taxes and relatively lower benefits (through the retirement age increase), meaning that a typical person retiring today will pay more in Social Security taxes than they’ll receive back in benefits. So we’ve saved the budget, right? Wrong. Medicare has grown so much in terms of cost/generosity that a typical person retiring today will receive around $260,000 more in Medicare benefits than they paid in taxes. Has Social Security redistributed from whites to minorities – or is it the othe rway around? Caleb Quakenbush, Karen E. Smith and Eugene Steuerle of the Urban Institute have an interesting new study looking at how Social Security redistributes according to race, a topic which has long generated controversy in policy circles. But the authors take a new angle on things: looking not only at how Social Security taxes and benefits are distributed within a single birth cohort, but also across time. For instance, Social Security was far more generous to earlier birth cohorts (who tend to be more predominantly white) and less generous to later ones (who have greater numbers of minorities). As a result, the program may be redistributing from these younger, less-white generations to older, ‘whiter’ generations. 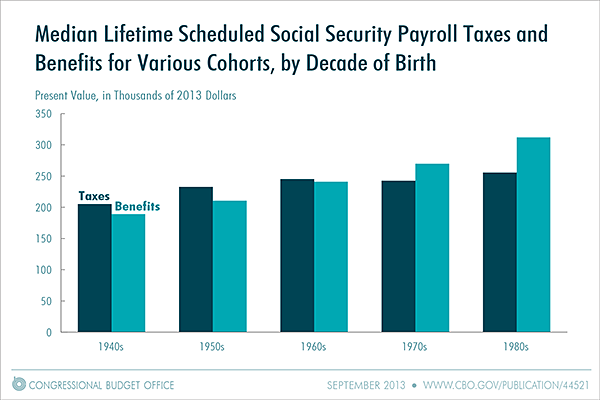 This brief considers how Social Security’s many benefit and tax features have redistributed across groups over time. Using Current Population Survey data from 1970 through 1994 and microsimulation projections from the Urban Institute’s DYNASIM3 model, we find that for many decades, Social Security redistributed from blacks, Hispanics, and other people of color, to whites. These transfers will likely to continue in future decades. Our findings suggest that future reforms that place the burden of Social Security reform solely on younger, more diverse generations may have undesired distributional consequences if the aim of the program is to provide greater relative protections to more vulnerable groups. There is a tremendous amount of policy interest in the potential use of the chained CPI-U for cost of living adjustments to various social programs, including social security. This statistical / survey methodology talk is intended to provide the audience with a thorough background on and understanding of the building blocks of the CPI-U, the CPI-W, the chained CPI-U as well as the much discussed experimental CPI for the elderly (CPI-E). How social security payments are adjusted using the CPI-W is presented as well as how social security payments would have varied in the past using alternative indexes for cost-of-living adjustments. Finally, the challenge of constructing a production ready non-experimental CPI for a demographic group such as the elderly is discussed. Press: Please email :info@national-economists.org with your attendance status and the date of attendance. It will be assumed that lunch is NOT requested. If lunch is requested, please contact me in advance, prior to the date of the event, for registration and payment instructions at the member rate. The Center for Retirement Research at Boston College announces the 2014 Dissertation Fellowship Program for research on retirement income and policy issues, funded by the U.S. Social Security Administration. Up to two fellowships of $28,000 will be awarded. The submission deadline for proposals is Friday, February 14, 2014. Award recipients will be announced by April 2014. Visit the Dissertation Fellowship website to view the proposal guidelines. A new Michigan Retirement Research Center Working Paper is available. Economists’ standard model assumes that improvements in total factor productivity (TFP) raise the marginal product of labor for all workers evenly. This paper uses an earnings dynamics regression model to study whether, in practice, older workers benefit less from TFP growth than younger workers. We utilize panel earnings data from the Social Security Administration’s Continuous Work History Sample. The data include workers of all ages, and we use annual figures for 1950-2004. Our first specification relies on BLS measurements of TFP. Our second model develops a new TFP measure using a principal components analysis. We find that although the earnings of younger workers track TFP growth 1-for-1, the earnings of older workers do not: we find, for example, that a 60-year-old male’s earnings grow only 85-90% as fast as TFP. Nevertheless, our analysis implies that in an economy with an aging labor force, gains from experience tend to outweigh older workers’ inability to benefit fully from TFP improvements. • We develop an earnings dynamics model that shows how technological progress affects workers’ earnings at different ages. • Analyzing earnings data from 1950-2004, we find that earnings of younger workers rise commensurately with increases in productivity, whereas, earnings of 60-year old workers grow only about 90% as fast as overall technological progress. • However, we find that earnings growth from accumulating experience for older workers more than compensates for declines in ability to benefit from improvements in technology. • Although increases in longevity presumably encourage workers to consider longer careers, declines in earning power likely have the opposite effect, especially during eras of rapid technological change. The Bush Center’s Ike Brannon blogs against the idea that, to fix entitlements, all we need is a little more economic growth. In reality, he says, growth is good but not nearly enough. Check it out here. The Social Security Disability Insurance (SSDI) program is rapidly approaching insolvency. According to the Social Security Trustees, the program's trust fund will be exhausted some time in early 2016, forcing a reduction in financial support for individuals with a disability. Although many lawmakers in Congress appreciate this problem, most of them appear unwilling to propose reforms to the program, says Jagadeesh Gokhale, a senior fellow with the Cato Institute and a member of the Social Security Advisory Board. One explanation for this inaction is the availability of an easy short-term fix: temporarily transferring funds from SSDI's larger companion trust fund, the Social Security Old Age and Survivors Insurance (OASI) program. According to the Trustees, the OASI trust fund will not be exhausted until 2034. Another explanation for congressional inaction is that the two major political parties are so far apart on how to reform SSDI that there is little chance of developing a workable coalition. Gokhale proposes a different approach to providing work incentives to SSDI beneficiaries, one that involves benefit offsets but provides greater flexibility to beneficiaries in selecting their level of work activity. The Generalized Benefit Offset (GBO) program that Gokhale proposes would eliminate the cash cliff (the loss of benefits and valuable health care coverage), but it conditions the change on observed earnings. GBO allows reversion to beneficiary status when labor force attachments cease, at the full discretion of SSDI beneficiaries. Under GBO, one would expect beneficiaries to sort themselves according to their work abilities along the GBO schedule rather than park at the Substantial Gainful Activity earnings level. The distribution of resulting work and earning choices by SSDI beneficiaries would generate direct benefits to the economy and to SSDI beneficiaries themselves. GBO should receive broad support from disability advocates, policy practitioners, and (most importantly) lawmakers from both sides of the aisle because it combines key elements that their constituents are demanding: better support for individuals with disabilities but also opportunities to work whenever their health impairments permit market participation. GBO eliminates the cash cliff and would, if adopted, introduce stronger and more effective work incentives for work-capable beneficiaries while retaining SSDI insurance for individuals with disabilities. Source: Jagadeesh Gokhale, "A New Approach to SSDI Reform," Regulation, Fall 2013.